Use comments when you want people to review and provide feedback on a presentation that you created, or when colleagues ask for your feedback on a presentation. A comment is a note that you can attach to a letter or word on a slide, or to an entire slide. Select Review > New Comment. Or select New if the Comments pane is open. In the Comments pane, type your message in the box and press Enter. Select the comment icon on the slide. The Comments pane will open and you can see comments for that slide. Select Reply to respond to a comment. Select the Next or Back buttons to go between comments and slides. In the Comments pane, select the comment you want to delete and select the X. On the slide, right-click the comment icon and select Delete Comment. 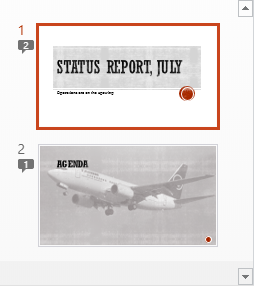 To add a comment about text or an object on a slide, select the text or object. To add a general comment about a slide, click anywhere on the slide. Type your comments, and then click outside the comment box. Tip: You can add more than one comment to text, an object, or a slide in a presentation. 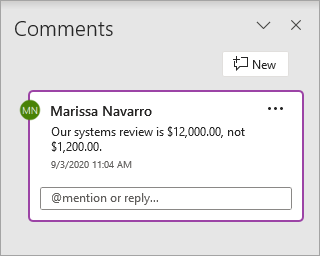 Presentation reviewers can edit comments added by other reviewers, which changes the color of the review comment thumbnail and changes the initials to those of the current reviewer. Click the review comment thumbnail (shown as number 3 in the image above). The review comment thumbnail generally contains the initials of the person who originally added the comment. If the review comment thumbnail is hidden, on the Review tab, in the Comments group, click Show Markup. Presentation reviewers can delete comments added by other reviewers, which changes the color of the review comment thumbnail and changes the initials to those of the current reviewer. Click the comment that you want to delete. Delete All Markup on the Current Slide Removes comments from the slide that you have open. Delete All Markup in This Presentation Removes all comments from the entire presentation. To hide the comments in your presentation, click Show Markup on the Comments tab. Click Show Markup again to unhide the comments. To move between comments, on the Review tab, in the Comments group, click Previous or Next. In the navigation pane, in Normal view, click the slide you want to add a comment to. Type your comment, and then click outside the comment box. To view a comment, click the comment thumbnail on the slide. 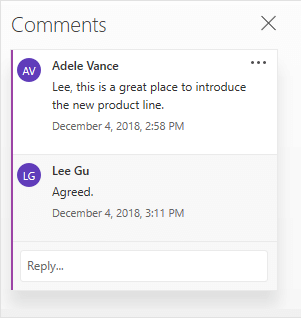 When you comment on a document or presentation and use the @-sign with someone's name, the person you mention receives mail with a link to your comment. For more details, see Use @mention in comments to tag someone. This feature requires PowerPoint for Office 365 for Mac version 16.24. Click the comment thumbnail on the slide that you want to edit. In the Comments pane, click the comment you want to edit, and then click again to make changes, or click Reply to respond to a comment. Tip: Select a comment thumbnail on a slide to see the corresponding comment in the Comments pane. Select and drag the comment thumbnail to a different location on the same slide. Click the comment thumbnail you want to delete. On the Review tab, click Delete, and then click Delete again, or choose an option to delete all the comments on the slide or in the presentation. Tip: You can also delete a comment by holding down the Ctrl key while you click the comment, and then click Delete. On the Review tab, click Show Comments. In the navigation pane, click the slide that you want to add a comment to. Note: To view a comment, click the comment thumbnail on the slide. In the navigation pane, click the slide with the comment that you want to change. On the Review tab, under Comments, click Edit. Tip: You can also edit a comment by double-clicking the comment thumbnail. Select and drag the comment thumbnail to a different location. Click the comment thumbnail that you want to delete. On the Review tab, under Comments, click Delete, and then click Delete Comment. Tip: You can also delete a comment by holding down CTRL while you click the comment, and then click Delete Comment. On the Review tab, under Comments, click Show. When you open a file that already has comments in it, the Comments pane opens on the right margin of the window. In the slide thumbnail pane on the left side, small comment indicators with numerals inside show which slides have comments on them. On the Review tab, click Show Comments > Comments Pane. Select the item on the slide that you want to add a comment about. A comment bubble appears next to the item on the slide that you commented about. This feature is available when you sign in to Office.com with your Office 365 work or school account, and you're working in a presentation that's saved in a SharePoint library or OneDrive for Business. This feature requires PowerPoint for Android version 16.0.11231. Find a slide with comments on it. Tap the Comment button to open the Comments pane for reading and responding. Double-tap the slide that you want to comment on. Tap the New Comment button on the floating toolbar. The Comments pane appears full screen with a blank notation indicating your name and the date. Type your comment. Press Done to resize the Comments pane and make your slide visible again. Use the buttons on the Ribbon to navigate backward and forward through comments. Type your comment. When you're done, tap the close button (X) in the Comments pane. You can also use the buttons on the Ribbon to navigate backward and forward through comments. When you comment on a document or presentation and use the @-sign with someone's name, the person you mention receives mail with a link to your comment. Tap the New Comment button on the floating toolbar . On the Review tab, tap Show Comments. The Comments pane opens, where you'll see any comments that have already been added to the presentation. Tap the slide that you want to comment on. The Comments pane appears with a blank notation indicating your name and the date. Type your comment. Tap elsewhere on the screen when you are done typing. You can't add comments in PowerPoint on a Windows tablet. In the Comments pane, immediately under the comment you want to respond to, tap the Reply box and begin typing. You can't reply to comments in PowerPoint on a Windows tablet.